Sweatshirts - A red polo or grey oxford must be worn underneath with the collar exposed - M-Th. The collar is not required on spirit wear days. At Meridian School, we believe that the purpose of uniforms is to foster a sense of community and to allow students to focus on what matters most in the classroom, the academics. Before you begin shopping for school uniforms, shoes, backpacks, etc., please take time to review the attached Uniform Guide for primary students. This user-friendly guide includes information and photo examples that will help answer your most frequently-asked questions about the Meridian dress code policy. The purpose of the dress code policy is to enhance the learning environment at Meridian. Thank you for your principled cooperation in making sure your student's attire meets the requirements outlined in the attached guides. If you have questions about the dress code policy, please email Jennifer Noonan at jennifer_lee_noonan@yahoo.com. Since a uniform was adopted for PE at Meridian, parents have reported difficulties in finding items that meet the uniform guidelines. There have also been inconsistencies in students wearing the correct uniform. 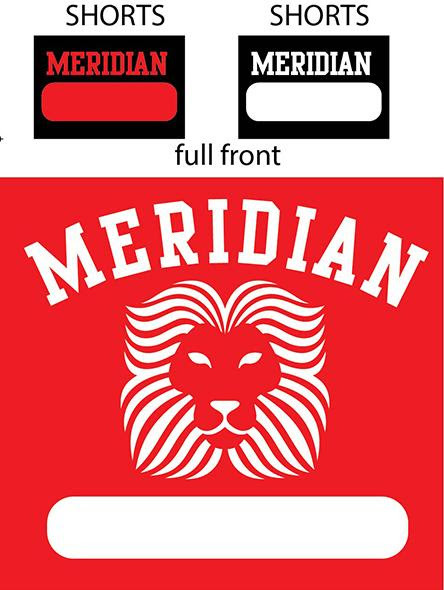 To address these concerns, Meridian School has arranged for a uniform to be purchased through Rock Sports. Starting in 2018-2019, this will be the required uniform for Meridian School PE in grades 6 through 9. Both tops and bottoms will have a space for the parents to write their child's first name and last name (if space allows) in sharpie. Students can buy 1 set and wash it weekly, or buy multiple sets if desired. The total will be $20 for the top and bottom. Rock Sports now has these in stock for purchase. PE uniforms do NOT need to be preordered.